Dumfries and Galloway has lots of unspoilt countryside and can be found in the south-west corner of Scotland. To the north, the council borders onto South Ayrshire, East Ayrshire and South Lanarkshire; in the east the Scottish Borders; and to the south the county of Cumbria in England. You can find miles of deserted beaches, estuaries full of wildlife and the Galloway Forest Park, 300 square miles of forest, moorland and lochs where you’re more likely to see a deer or bird of prey than another human being. To the west, from Stranraer and Cairnryan, are ferry connections to Belfast and Larne in Northern Ireland. An interesting detail is that the Mull of Galloway, in the south-western tip, lies further south than Newcastle in the UK. 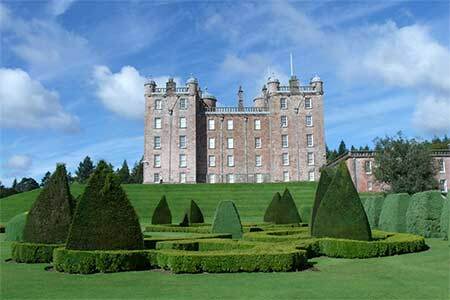 Dumfries and Galloway is also well-known for its many artists and writers. The three distinct scenic areas are the Nith Estuary which follows the River Nith southward from Dumfries into the Solway Firth. On the east bank there is the village of Glencaple, Caerlaverock Castle, Caerlaverock Wild Fowl Trust, an ancient Roman fort on Ward Law Hill and neaby in Ruthwell is the Ruthwell Cross and the Brow Well where Robert Burns “took the waters” and bathed in the Solway just before his death. On the west bank there are several walks and cycle routes in Mabie Forest and Sweetheart Abbey in the village of New Abbey. Criffel (569 metres) offers the hill walker a reasonably modest walk with excellent views across the Solway to the Lake District. The house of Paul Jones founder of the American Navy is also open to visitors near Kirkbean. East Stewartry takes in the coast line from Balcary Point, east of Kirkcudbright, eastward across Auchencairn Bay and the Rough Firth past Sandyhills to Mersehead. There are several attractive coastal villages within this area – Auchencairn, Kippford, Colvend, Rockcliffe, and Portling. There is also a unique round tower at Orchardton and the islands of Hestan Isle and Rough Island can be reached at low tide outside the breeding season for birds. Mersehead is an excellent wildfowl reserve. The area is well provided with coastal paths. Fleet Valley, includes Fleet Bay with its popular holiday destinations of Auchenlarie, Mossyard Bay, Cardoness, Sandgreen and Carrick Shore. The area also includes the town of Gatehouse of Fleet and the historic villages of Anworth and Girthon – there is a castle at Cardoness in the care of Historic Scotland. There are pleasant hills to walk in around Cairnharrow and Kenlum and Castramon Wood at the north end of the area is a joy particularly with the bluebells in spring. 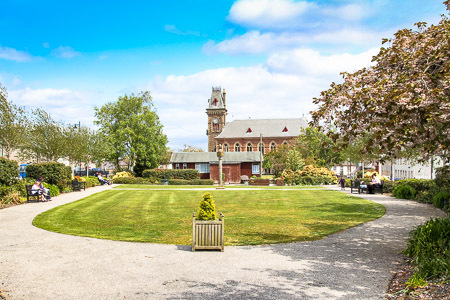 Dumfries, capital of Dumfries and Galloway, has a rich history going back over 800 years as a Royal Burgh (1186) and is particularly remembered as the place where Robert the Bruce murdered the Red Comyn in 1306 before being crowned King of Scotland. His mausoleum is in St Michael’s graveyard. Today it is the biggest town in south west Scotland, the administrative centre for Dumfries and Galloway, and the focus of a large rural hinterland. 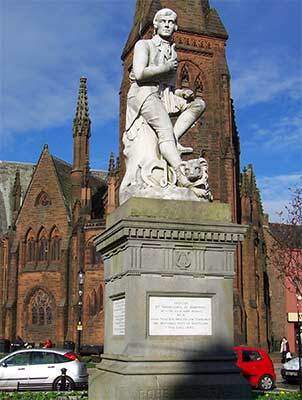 Greyfriars Church in Dumfries overlooks a statue of Robert Burns, sculpted in Italy in 1882. Burns spent the last years of his life in Dumfries, dying here in 1796. The statue is just one of a series of associations with Scotland’s most famous poet to be found in the town. If you head south past the spectacular Mid Steeple, once the town tolbooth and prison, you come to a tiny vennel leading to the Globe Inn, his favourite drinking place. You can also find Robert Burns’ house at 24 Burns Street, south of the High Street, and his mausoleum in St Michael’s Churchyard. On the west side of the River Nith is the Robert Burns Centre, housed in what was once the Dumfries Old Town Mill. Beyond it is Dumfries Museum built partly in a windmill later converted to a camera obscura. Wigtown, a former burgh south of Newton Stewart, is known as Scotland’s “Book town” and compared to Hay-on-Wye in Wales for the same reason. There is a significant difference from Hay-on-Wye: Wigtown’s status as a book town was planned, in order to regenerate a very depressed town (the main employers, the creamery and distillery, having closed in the 1990s), although the distillery (Bladnoch) has now re-opened and is distilling its own malt whisky. There was a national search (in Scotland) for a candidate town. Wigtown now has over 20 book-related businesses including bookshops and publishers. The demand for bookshops has exceeded supply of typical premises, leading to bookshops in surrounding villages, in industrial units, and in people’s homes. The town now also plays host to a successful bi-annual Wigtown Book Festival. 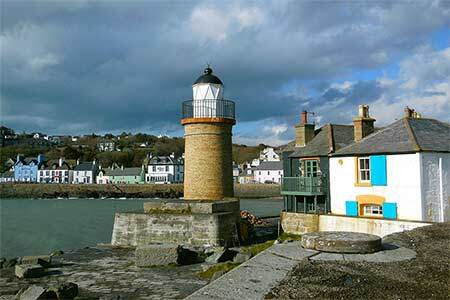 Portpatrick, on the Rinns of Galloway peninsula, involves quite some travelling but this attractive village is well worth the trip. Just south of the village is the clifftop location of the ruins of Dunskey Castle, dating back to the early 1500s, while in the village itself the roofless remains of the Old Parish Church are attached to a circular tower also dating back to the 1500s. The former railway link to Portpatrick Harbour was removed as early as 1875 and the line to Stranraer closed completely in 1950. But by the time the ferry traffic departed, Portpatrick had already established itself as a popular resort and that is very much how it continues today. The south end of the village provides one of a number of car parks for visitors, and gives some of the best views. Here you find the Lighthouse Pottery, plus the small brick-built harbour lighthouse. Stand on the harbour wall nearby and you see the length of the village stretching away to your right, and ahead of you the inner harbour, sheltered by its rocky islet.